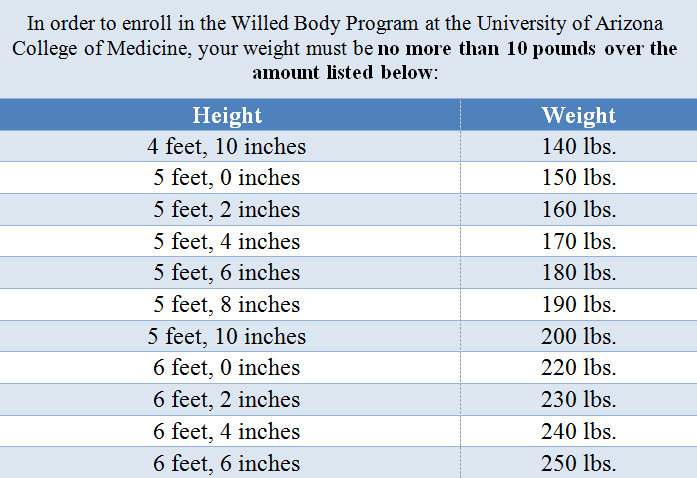 Who may donate to the Willed Body Program? Any person 18 years old and older who is at least a part-time resident of Arizona may enroll as a body donor with the Willed Body Program. There is no upper age limit. Please note: All donors must be enrolled and active in our database to be considered for acceptance into the program. Can the Willed Body Program deny my donation at the time of death? It is advisable to have alternate arrangements in place should your donation be declined. How will my donation benefit the program? Donors support medical training and education at the University of Arizona College of Medicine's Tucson and Phoenix campuses, as well as education and training at other accredited educational institutions throughout the United States of America. In most cases, the costs of transportation is covered by the Willed Body Program. If a funeral home must be used, all costs associated with services, storage and transportation by the funeral home are the responsibility of the family or responsible party. Can part-time residents of Arizona enroll? Yes. However, the program can only accept deaths that occur within the State of Arizona. Can I enroll on behalf of someone else? No. The Willed Body Program cannot accept paperwork that is not signed by the donor. What is the process following the death of a body donor? After a body donor's death is pronounced, a family member or medical caretaker must contact the pager number listed on the body donor card. Final acceptance into the Willed Body Program will be made at that time. 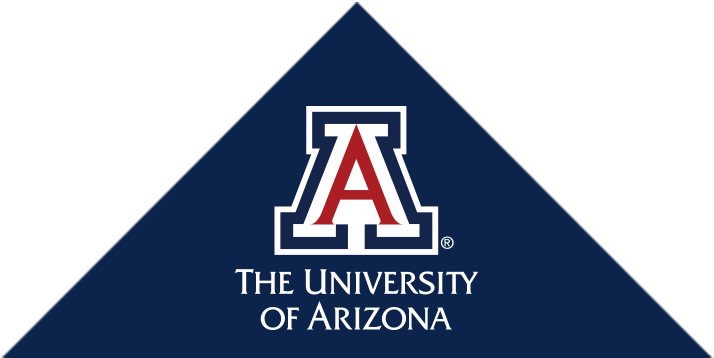 If accepted, arrangements for transportation to the University of Arizona College of Medicine in Tucson, Arizona will be made. Please note that transportation does come from Tucson. It may take a few hours to arrive at the location of the donor. Families may choose, at their expense, to make arrangements for a local funeral home to hold the donor at their location until the Willed Body Program’s transportation arrives. If declined, the donor’s family or other responsible party will need to arrange an alternate disposition. Is it possible to view the donor after they have arrived at the Willed Body Program? Unfortunately it is not possible to view the donor once they have arrived at the Willed Body Program. It may be possible to arrange for a family viewing at a local funeral home, at the families’ expense. Please note that a visitation with embalming is not possible due to time constraints and the anatomical preparation process. Is it possible to know or receive a report detailing how the donor’s body was used? Due to the anonymity of our donors while they are teaching, no pathological findings or reports are kept. Most donors teach anatomy, but they can also teach continuing education courses for physicians and surgeons. Will the donor's organs and tissues be used for transplants or research? No. The Willed Body Program is a whole-body donation program created for the purpose of furthering medical education and training. A donor's body will not be accepted at the time of death if organs or tissues are removed by another donation program (with the exception of the corneas). Upon completion in the Willed Body Program, what happens to the donor's body? All donors are cremated and the cremated remains are scattered in a professional and dignified manner by the Willed Body Program. Cremated remains will not be returned to the donor’s surviving family. Please make sure to discuss your wishes with your family prior to submitting your enrollment paperwork. Do you need to state your wish to donate your body in your will? You do not need to state your wish for body donation in your will. However, it is advisable to let others know of your decision regarding body donation to ensure your wish is carried out. The Willed Body Program will not accept a body donation over family objections. Please click here to go to our enrollment page. Once your enrollment is accepted, you will receive a Body Donor Card indicating your arrangements to donate your body for medical education and training. Please sign your card and carry it with you, as it lists the phone number to call in the event of your death. Please allow four weeks for processing and receipt of your donor card.